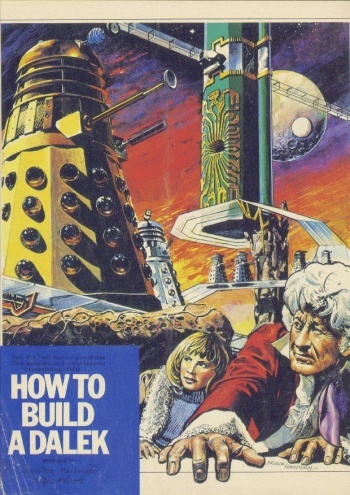 If you've ever wanted to build your own Dalek, now you can with blueprints straight from the BBC. The Daleks are one of Doctor Who's mortal enemies, and try as he might, he just can't seem to make them go away. Thanks to official blueprints released by the BBC, he'll have even more to contend with, built by enterprising fans of the long-running television show. Back in the early 1980s, a Doctor Who fanatic wrote to the BBC requesting for help so that he could build his own Dalek at home. Amazingly, the Doctor Who production office wrote back with an entire booklet that contained detailed blueprints (with a spiffy cover) that showed exactly how to do it. The only catch was that the fan couldn't use the Dalek for commercial purposes. The blueprints say that the average Dalek build should be divided up into five sections: head, neck, shoulders, body, and base. They also give lists of specific materials needed, such as car wax, modeling clay, and a plunger (I knew that's what that was!). They're hosted here by a fellow named Tom that used them as a reference for a 3D modeling project. You, however, should use them to create one of the most terrible scourges that the universe has ever known, and post pictures afterward.